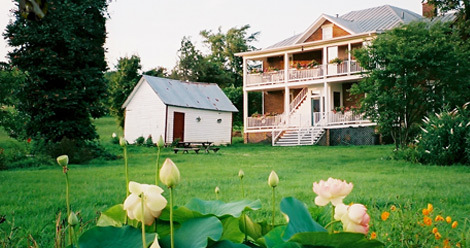 Blueberry Hill Farm vacation rental has all the charm of a Bed and Breakfast but with the privacy and leisure of a guest cottage, located midway between Lexington and Staunton in Virginia’s historic Shenandoah Valley. The suite is located in the upper part of our home with a private entrance via the upstairs porch. It includes a bedroom that sleeps three, kitchen, bathroom and year round sunroom. For those who wish the convenience, we offer a breakfast basket for an additional fee with items for breakfast on your own. From the sunroom you have a tree-top view of the farm, gardens, pond and distant mountains. We invite you to enjoy the farm: hiking, row boating, picnicking, or just relaxing on the porch taking in the beauty and serenity of the countryside – and maybe a glimpse of the wildlife. Or enjoy the many local attractions: visit numerous historic points of interest, take a scenic drive along the Blue Ridge Parkway, hike on nearby trails including the Appalachian Trail, visit neighboring Rockbridge Vineyard, or see a Shakespearean play at the Blackfriars Theater, or a show at the Virginia Horse Center.